The path follows the Hereward Way to Ely Cathedral. Initially by the side of railway line to A1101, skirting the field edge, the route is then along the A1101 to the junction with B1382. The verge is narrow and great care needs to be taken. The reminder of the walk follows the River Lark on the high bank, then through open countryside till it joins then crosses the B1382, before tree lined path into Ely. EASY WALKING. 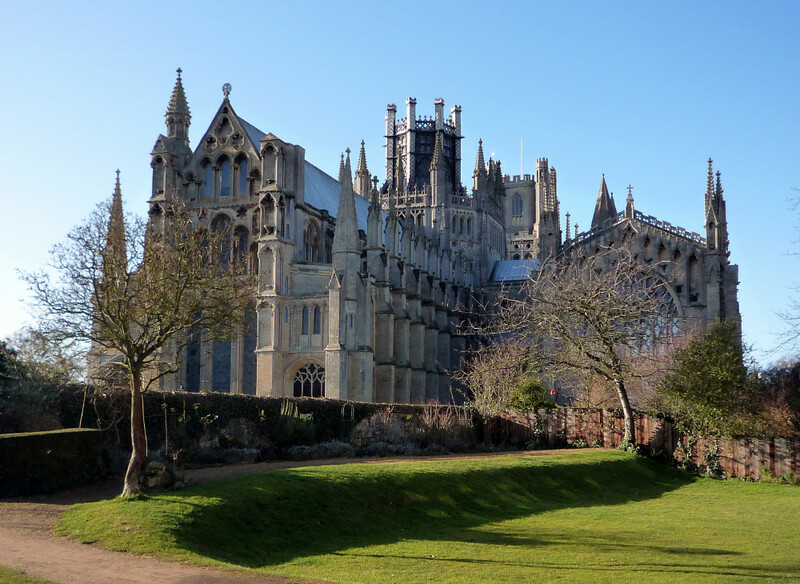 Download printable Guide: VBG9 Sedgefen to Ely. From Way Station go straight ahead, keeping to the concrete road towards Lodge Farm. Through the farm, along footpath towards the railway line which you then keep to the right. Proceed carefully over the wooden sleeper bridge. Cross the road to the entrance to Engine Farm. Engine Farm route when permission granted Proceed along the farm road on the green verge, keeping clear of the traffic. At end of farm road, cross over to the bank and climb upto footpath. Turn right along bank to junction with B1382 Permission has not been given to walk down the farm roadway, so turn right over the railway line following Hereway Way along the A1101. Cross railway line and climb bank on left hand side and proceed towards Prickwillow village. Walk through village, over bridge until junction with Putney Hill Road. Turn left, then take right fork (Old Bank) almost immediately following Hereway Way signs. Continue straight on along Middle Fen Bank, following Hereward Way. At junction with B1382, turn left and then cross road towards metal bridge. Cross road and go over metal bridge. Follow path towards Cuckoo Bridge. At concrete road, go straight ahead following footpath sign through W A Cooke & Sons yard down Kiln Lane. Cross railway. Take tree-lined footpath into Ely. Follow signs to the cathedral. There is no waystation in Ely. The Installation Artwork for this waystation is the Cathedral itself.